Britain's Matt Wallace shot a two-under-par 70 in the third round of his debut appearance at the Players Championship to move to four under at Sawgrass in Florida. 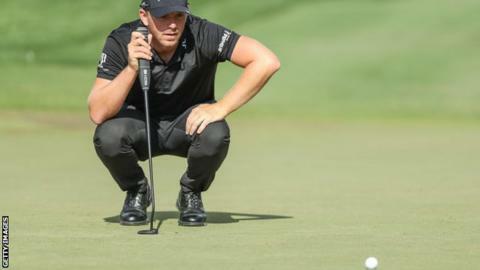 The 28-year-old Londoner holed a crucial par putt at the last which, he said in his Players diary for BBC Sport, gives him important momentum for Sunday's final round. I thought of the headline for this as I was walking up the last hole: 'The good, the bad and the average'. Three birdies and one bogey was relatively boring and not much excitement for me but I enjoyed it and there were plenty of positives. It was another grind out there but I played nicely and after Friday when my pace-putting was so poor I got the speed of the greens perfectly. There were some real long ones that I put to tap-in range. That was very pleasing - I was back to my usual standards on the greens. If I can give myself a few more birdie chances in the final round there could be a low one in there. I'm still driving it very well. I managed to save myself when I needed to sometimes and that comes down to hitting some good chips and putts. But I just have not quite got anything going. The 16th was a prime example. I hit a great drive down there and it ended up running into the first cut of the rough right on the edge. If it had stayed in the semi-rough or gone fully into the rough it would have been fine and, although I did make a birdie, I could not really attack it from there. The switch to a northerly wind definitely favours a draw and I hit a fade so I did struggle a bit on some holes. I played with Corey Conners and it was was the best driving display I've seen, he was relentless with his little draw. Even though it was an early start on a Saturday, there was no way I could lower my intensity. This is the Players Championship and every shot counts, every position means something because there are big world ranking points up for grabs. And the crowds were out there at 9am. So you want to put on a show and play some good stuff. If you don't concentrate and you are not out there to play well at this place, you will shoot very high scores, it is as simple as that. I'm hoping the wind picks up in the afternoon because that will help my position. Holing that 11-footer at the last for par was massive. I played the wrong shot with my eight-iron approach so did not make the most of another great drive. I will particularly remember the 17th hole because I had the exact same putt as the famous double breaker that Tiger Woods holed in 2001. His went right and mine stayed straight, I could not believe it - what was going on there? But I was so pleased with my holing out on the final green. That gives me something to go into Sunday with - it definitely gives me momentum for the final round.